Marlene Malek is Vice Chair of the Friends of Cancer Research (Friends) Board of Directors. Friends is an advocacy organization based in Washington, DC that drives collaboration among partners from every healthcare sector to power advances in science, policy, and regulation that speed life-saving treatments to patients. During the past 20 years, Friends has been instrumental in the creation and implementation of policies ensuring patients receive the best treatments in the fastest and safest way possible. Previously, Ms. Malek served as Board President from 1996 to 2016 and was instrumental in the founding and establishment of Friends. As Vice Chair, Ms. Malek works to mobilize support for increased cancer research funding. In 1993, Ms. Malek received a Presidential Appointment to the Board of Trustees of the John F. Kennedy Center for the Performing Arts. She also serves on the Community Board at the Kennedy Center. 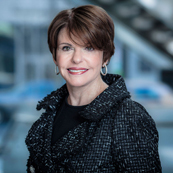 In addition, Ms. Malek is an active member of the Collectors Committee at the National Gallery of Art and serves on the Board of Directors of the National Museum of Women in the Arts. In the educational realm, she is Vice Chairman of the Board of Directors at Marymount University and was awarded Marymount University’s “Mother Gerard Phelan Gold Medal,” in honor of her outstanding contributions as a community volunteer and health care advocate. Past recipients include Nancy Reagan, Betty Ford, Lynda Bird Robb, Baroness Maria von Trapp and Clare Booth Luce. In addition, the Malek School of Health Professions at Marymount University is named in honor of Ms. Malek and her husband Frederic V. Malek, for their service and commitment to the institution and cancer research. Ms. Malek has worked as a home care volunteer for Hospice, where she has provided physical and emotional support to terminally ill cancer patients and their families. In 1991, she received a Presidential appointment to the National Cancer Advisory Board. Sponsored by the National Cancer Institute, she initiated the Breast Cancer Education Summits, which were implemented at cancer centers across the country. Currently, Ms. Malek serves on the Board of Directors of Duke University Comprehensive Cancer Center where she received the “Shingleton Award” for service on the Board. Additionally, she is a member of the Advisory Council of the George and Barbara Bush Endowment for Innovative Cancer Research at the MD Anderson Cancer Center in Houston, Texas. Ms. Malek is also a member of C-Change (formerly the National Dialogue on Cancer) and the Cancer Leadership Council at the Mayo Clinic in Rochester, Minnesota. Malek was also honored by Washingtonian magazine as a Washingtonian of the Year. Marlene Malek, married to Frederic V. Malek, Chairman of an investment-banking firm, resides in McLean, Virginia. They have two grown children.